When it comes to sneakers I want traditional, classic shapes. I stick with Chuck Taylors, occasionally go for Adidas shell toes and every once in a while I want a Vans slip on. I like the look and feel of classic sneakers, they’re simple and usually come in a rainbow of colors so I have my options for the summer. Of course when I saw the Hello Kitty Vans I knew these were going to be the latest piece added to my evolving and constantly growing shoe collection. The Vans Hello Kitty collection is a limited edition collection and I’m pretty sure that they’ll sell out quickly. They come in kids and adult sizes, so of course I had to grab a pair. 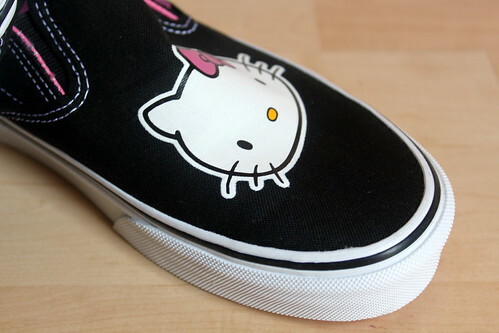 I went pretty simple and picked up the all black Vans with Hello Kitty’s face at the toe of the shoe. I think they’re so adorable! I love the pink bottoms on the shoes too, that extra girly little touch. I know I’m 30+ but I’ll always be a Hello Kitty lover and transported back to 5 year old DWJ. I had a little Hello Kitty cross body purse in kindergarten! If you’re as big a fan as I am, I’d definitely suggest you add these to your must buy list and quick! Or they might be gone! so cute. i love all the patterns! i snagged myself a pair of the pink lace ups with the multi colored HK design. i even got my niece a matching pair. vans did good on this collaboration. I love anything Hello Kitty. 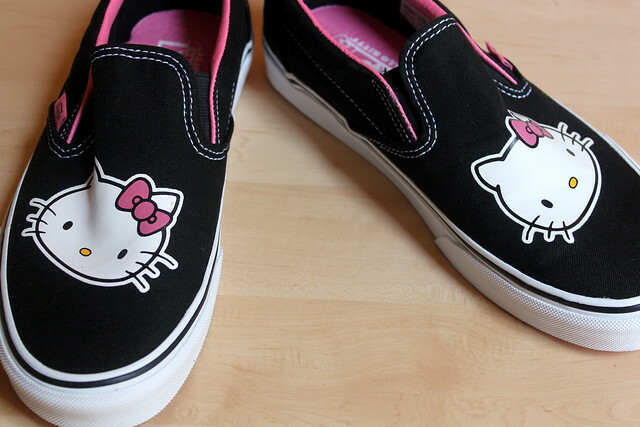 I wanted the get the black checkered ones with the small Hello Kitty faces…But these are too cute! Very cute! I’ve always loved Hello Kitty!